Thanks for checking out our site. We are so glad that you stopped by and hope we can answer most of your questions here. Below you will find out a little bit about who we are and what we believe. If you have any questions, please reach out to our office at office@lajollacf.org and we will do our best to get you an answer. We look forward to meeting you soon! LJCF was founded in 1927 as First Baptist Church of La Jolla. Since then, the church has seen many seasons of effective ministry. Today, under the leadership of Pastor Adam Stadtmiller we are again experiencing times of renewal and refreshing. La Jolla Christian Fellowship remains under the covering of the American Baptist Churches Of the Northwest and celebrates its traditional, rustic and longstanding values. Transparency: We practice transparency as an organization in a way that allows its decisions and actions as an organization to be clearly observed. This includes its strategic decision making and financial accountability. Simplicity: We practice simplicity of process so that our community can more easily focus on what is strategically and fundamentally important in the furthering of its Christ following. As a community, we seek to limit programs while still encouraging the gathering of the saints for authentic community, prayer and fellowship. We do this mostly withing our community group structure and at our weekly Sunday fellowship meals. Prayer: We desire to be a community that is defined and shaped by its prayers. Prayer is at the center of all we do and practice at all levels of community life. Christ Sharing: We seek to share the good news of Jesus salvation with as many people who will listen. One of the ways that we do this is through our Alpha course. God’s Word: We follow the teaching held within the Bible as the fully inspired Word of God, the only infallible rule for faith and practice. Casual Excellence: It is our desire to present the excellence Christ deserves in our daily living and church practice. This includes our Sunday services, communication platforms and group life. With that said, we intentionally shy away from slick or performance based ministry models that place paradigms of ministry perfection in front of its people. Simply put, we don’t preach authenticity and brokenness while trying to maintain airs of burdensome perfectionism. Authenticity: We practice authenticity in relationships, encouraging our people to throw off cultural models of perfectionism and false pretense while sharing their brokenness in safe and healthy ways. Hospitality: We practice creating multi-layered environments of welcome and hospitality that seep into every layer of our church community. We desire to create safe and inviting places where people can explore and grow in their faith. Multi-Generational: We value all generations and seek to include each into every area of body-life. We practice this in the building of our teams (Worship, Greeting, Etc) and our community groups. Fun & Play: We believe that church should be fun, a place where you can come, be yourself, laugh and enjoy God and others. The governance of LJCF is three-fold and consists of our Lead Pastor, Elder Board, and voting church members (Meet Our Leadership). 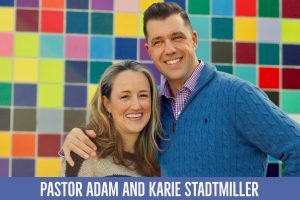 Pastor Adam Stadtmiller is our Lead Pastor and prophetic visionary. Under his guidance, our gender-diverse Elder Board members act as co-laborers to approve, implement and oversee all matters of church life. Finally, those in our congregation who have chosen to take on the responsibility of membership vote to approve or disapprove matters of church direction. This includes, but is not limited to, ratifying our yearly budget and selecting pastoral staff. We believe that every Christ-follower who chooses to be a regular participant in the life of LJCF is a member of our church family. As a member or that family, we believe that they will want to support the community by giving of their time, treasure and talent. We view organized church membership as a responsibility of church family which might or might not be right for all of our regular attenders. Many believers have no interest in being part of what might be called church politics. We honor that as a church and realize that the only church membership that has any lasting value is being a member of the living Body of Christ. There are no second class citizens at LJCF. With that said, many Christ-followers do want to have a say in where their church is headed. For them, organized church membership is appealing. As a member of our church, you are tasked with a voice to approve or disapprove matters of extreme church importance. This includes, but is not limited to, ratifying the yearly church budget and the hiring of any new pastoral staff. If you would like to know more about membership at LJCF, please contact Membership Coordinator Drea Gallegos at drea@lajollacf.org. We believe in all of the great and central Christian doctrines including the Trinity; the Virgin Birth, the Deity of Jesus Christ, Forgiveness of sins through faith in Christ and His atoning work on the Cross; His Resurrection, His coming again to save His own, establishing His Kingdom, and judging the world. We believe that the Bible is the divinely inspired word of God perfectly created to accomplish its intended purpose. We preach, teach and seek to live by its inspiration and under its authority. We believe that worship is fundamental to our relationship with God. We seek to exalt Jesus Christ through wholehearted worship, through Christ-centered living and through our witness to others. We emphasize Christ’s Lordship and we take seriously His call to discipleship and His commission to take the Gospel to the entire world. We believe that Christian ministry is three-directional: upward, in Spirit-led worship; inward, in the development of true fellowship and Body Life; and outward, in mission and service to the world. And further, we believe that the chief end and highest motive of each of us is that God be glorified. We emphasize the essential role of the Holy Spirit in empowering, transforming and equipping Christians to effectively serve Christ and to build up His Body. We believe that all the gifts of the Holy Spirit are operative today and we welcome the Spirit of wisdom and revelation in the knowledge of Him. Our worship services, ministries and fellowship gatherings should allow freedom for the Holy Spirit to operate in the context of balance, order and love. We believe in the ministry of every believer, that every Christian has been called and gifted by the Holy Spirit for active ministry in the Body of Christ. We are committed to interdenominational Christian fellowship, recognizing that Christ’s Body is made up of all those who are born again of His Spirit, committed to His Lordship, and devoted to the unity of all believers.